Donald (Don) Drake Tinkham, 88, of Kennebunk died at Maine Medical Center on November 9, 2018 as a result of complications from heart surgery. Born on May 9, 1930 to Alfred and Mildred (Drake) Tinkham of Melrose, Massachusetts, Don graduated from Melrose High School, Tilton School in New Hampshire and Massachusetts College of Pharmacy. He is survived by his wife of 13 years Luverne (Lu) Clough Preble Tinkham of Kennebunk, a daughter Leslie Evangelo and a son Jeffrey Tinkham, both of Phoenix, AZ., four grandchildren and eight great grandchildren. He also leaves his “second family”: Lu’s sons Duane Preble and Derek Preble, daughters Laurie Pettengill, Kathi Preble Jordan, Lisa Preble, Kristen Woodman, her grandchildren and great grandchild: all who adored him and will miss our “Donnie” immensely. Don was an amazing presence in his family. He was kind, gentle, and a great listener, a generous soul who embraced a consistently positive outlook on life. He was quick with a smile, hug and laugh. He left everyone he met and everything he touched a little better off. Don served in the US Army Reserves from 1950 to 1953. 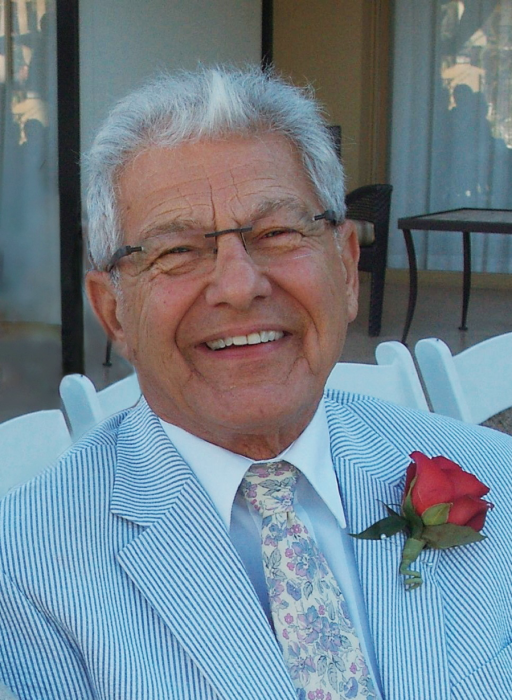 He moved to Arizona in the 1960’s and spent his career as a pharmacist at Osco/CVS. Don was an active member of the Church of the Beatitudes, Phoenix, Paradise Valley Church, Scottsdale and the Church on the Cape, Cape Porpoise, Maine. He was a devout Christian and loved God, church music and his church families. He had a beautiful voice and sang joyously in the church choirs. A gifted and passionate gardener, Don was happiest in the garden. He loved nature and spent countless hours outdoors with his trees, plants and flowers. He simply loved watching things grow. One of his greatest achievements was creating a spectacular, lush, green garden oasis in the driest of Arizona deserts. He and Lu travelled extensively, visiting many countries. Don had an adventurous spirit and embraced these trips with the greatest of enthusiasm. For example, he celebrated his 81st year by spontaneously bungee jumping in New Zealand. His first wife Karolyn, his brother John, and his sister Barbara (Tinkham) Conant predeceased Don. Don's family extends their heartfelt admiration and gratitude to the nurses, doctors and staff at Southern Maine Health Care (Biddeford) and Maine Medical Center (Portland) for their skill, exemplary care and loving kindness. We would be remiss to not thank the advocate that Don chose for himself. Thank you to Lisa Preble for her long and exhausting hours making sure that every “I” was dotted and every “T” crossed. The family is forever grateful. A celebration of his life will be held Saturday, November 17th, 1:00 pm at Church on the Cape, Langsford Road, Cape Porpoise, Maine. In lieu of flowers, please consider making a donation to Milestone Recovery, Development Department, 65 India Street, Portland, Maine 04101. For more information visit www.milestone-recovery.org. Don truly wanted all people to find contentment in the natural world. Online condolences may be expressed at www.oobfh.com.